It's no secret that I love sports romances. After seeing Creed over winter break, I knew that I was definitely in the mood for another fighter story, so I turned to Jeanette Murray's most recent release to quench my thirst. I feel like the more sports romances I read, the less sports are actually in them. 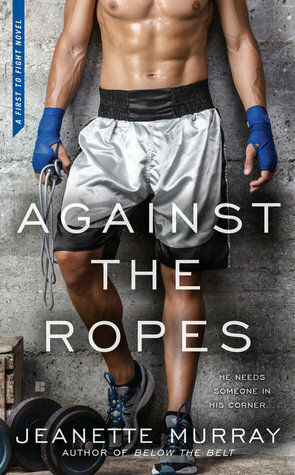 I loved that Greg was a boxer, but there was barely any actual fighting in the novel. When Greg was fighting, Reagan was too scared to see him get hurt so she left. So no fighting actually even happened! Where is the suspense and utter hotness of a male athlete in his element?? There was so much talk, but not enough action for me. While Greg and Reagan were cute, I didn't feel the normal pull towards their story. I was interested, but not intrigued. Greg was super sweet to Reagan and I liked how he tricked her into spending more time with them and how he was the one pursuing her. The story did have it's adorable side, but I was left wanting a little more from them. As far as sports romance goes, it was lacking on both the intensity of the sports and the passion of the romance. While it wasn't horrible, it wasn't fantastic. I might try out some more from Jeanette Murray, but if it's your first time reading her, I'd say start with something else.